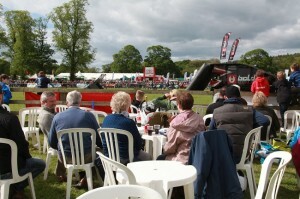 Northumberland County Show has something for everyone. Held on Bank Holiday Monday 30th May 2016 at Bywell Hall, near Stocksfield, and set in the beautiful parkland of Lord Allendale’s estate in Tynedale. This historic agricultural show attracts thousands of visitors from far and wide who enjoy the livestock and small animal classes, competitive baking and handicrafts, exciting main arena acts, shopping, local food and drink, and who like to simply soak up the atmosphere of the day. Falling in Whit Week, the May half term school holiday, it’s a popular event for families from around the region, as well as visitors across the country. There are superb examples of cattle, sheep, horses, dogs, alpacas and goats plus the chance to get up close to prize winning rabbits, guinea pigs and poultry. The whole family will enjoy this year’s Main Arena act, the Shetland Pony Grand National, with its tiny competitors and their young riders aged 8-13 entertaining the audience with hilarious high speed steeple chasing. 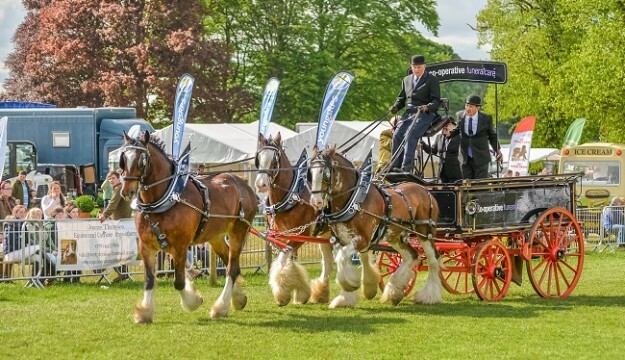 More elegant equestrian action can be seen in the BSJA Show Jumping rings, or the magnificent decorated heavy horses and their dray pulling teams.In the Castle Arena, the popular Tug-of-War Tournament and Britain’s Strongest Man Qualifier Competitions will run throughout the day. Don’t miss the magnificent Birds of Prey display, non-stop action sheep shearing, traditional Cumberland Wrestling, Stick Dressing and gun dog scurry. There is a dedicated Children’s Area where the younger visitors can enjoy meeting the baby animals, exotic reptiles and rare creatures from the zoo at Kirkley Hall. There are changing and feeding facilities for babies and toddlers. Kids will love the pony rides, climbing wall, arboriculture demonstration, have-a-go golf and mountain biking, and everyone can meet the animals in the poultry, rabbit and guinea pig sections. The Grand Parade at 3.30pm sees the winners from each livestock section on show in the Main Arena. It shouldn’t be missed as it culminates in the award of the highest accolade of the show, the ‘Champion of Champions’. Foot sore visitors can take a break while listening to live music. There is a huge range of hand cooked food and regional specialities, plus public bars, pretty tea tents and traditional beer gardens. There are outdoor trade stands with everything from decorative home ware, garden furniture and plants and country clothing to tractors and combine harvesters for sale. The indoor shopping marquees feature artisan crafts, paintings, jewellery and photography. In The Taste of the County marquee, you can buy delicious local food and meet top chefs, bakers, butchers and cheese makers. With seventy acres of parking, dedicated coach areas close to the show field, fast track entry for advance ticket holders, easy access to main roads, and lots of local accommodation options, this makes a great day out as a one-off event or as part of a longer tour of the north east.